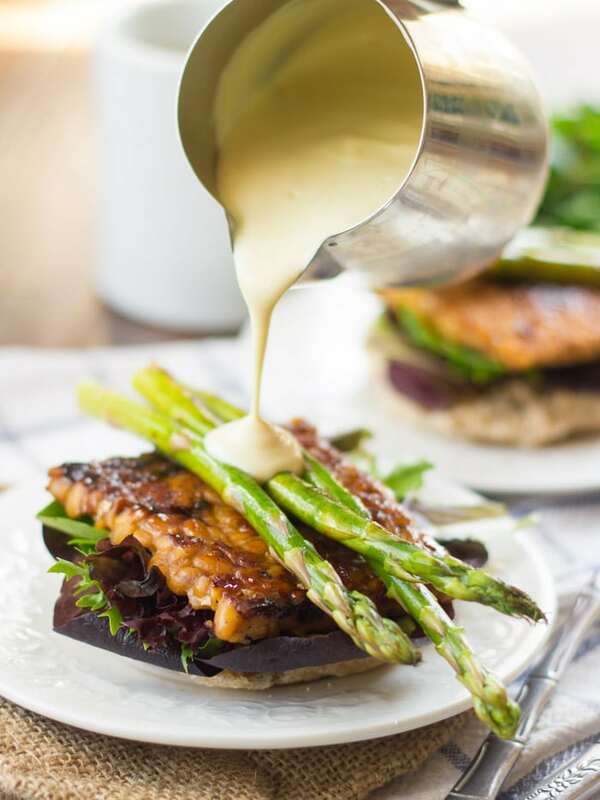 This vegan take on Eggs Benedict is made with smoky tempeh served atop toasty English muffin halves and topped with pan-seared asparagus and creamy vegan hollandaise sauce. I’m feeling a little self conscious. Two eggless eggy recipes in a row. Whoops! In my defense, I wasn’t thinking eggless anything when I put this week’s lineup together. I was more like, oh hey, easy midweek lunch fix on Wednesday, and then weekend brunch fix on Friday. Also, neither recipe actually contains eggs, so they’re really not all that similar. I’d never had any version of this dish until this one. Eggs with egg yolk sauce? No thank you! 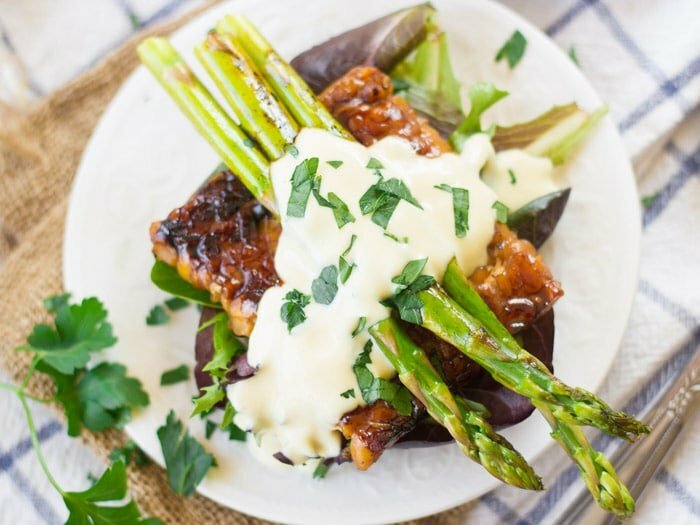 Tempeh with tofu sauce on the other hand, okay it doesn’t sound that exciting, but hear me out. The tempeh part of this recipe is bomb. I decided not to add a stand-in for the poached egg component because the temeph was so delicious and flavorful. It just seemed wrong. I debated using a few slabs of pan-fried tofu sprinkled with kala namak, and you can if you want, but it’s totally not necessary. My husband had to explain the taste of hollandaise sauce. Creamy and lemony and a little salty. I could swing that. He didn’t even realize the main ingredient was egg yolks. I went with silken tofu for a creamy base, a little bit of nutritional yeast for savory flavor, of course lemon, and just a little bit of vegan butter. I usually try to work around using commercial vegan butter or margarine, but I figured what they hey, this is brunch, so it’s probably a special meal. You can skip it if you’re totally opposed, but a couple of tablespoons of Earth Balance gave the sauce a nice buttery mouthfeel. So my vegan eggs benedict dining experience was a total success. I loved every sloppy bite of this meal. Cut each of your tempeh blocks in half, widthwise, so you have four squares, then very carefully slice each square in half, thickness-wise. Coat the bottom of a large skillet with oil and place over medium heat. Working in batches if needed, add tempeh slabs, reserving excess marinade, and cook until browned on bottoms, about 4 minutes. Flip and cook until browned on opposite sides, about 4 minutes more. Pour reserved marinade over tempeh and cook until liquid evaporates, about 1-2 minutes more. Remove from skillet and transfer to a plate. Place all ingredients into a blender or food processor and blend until smooth. Season with salt to taste and thin with a few tablespoons of non-dairy milk until desired consistency is reached. Taste test and adjust seasoning as needed. Coat the bottom of a large skillet lightly with oil and place over medium-high heat. Add asparagus and cook just until dark brown in spots and tender-crisp, about 3 minutes. 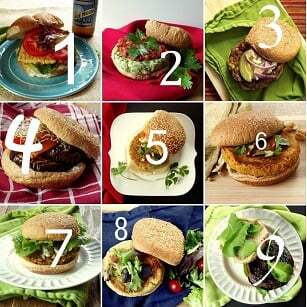 Place a few greens atop each English muffin half, followed by a tempeh slab. 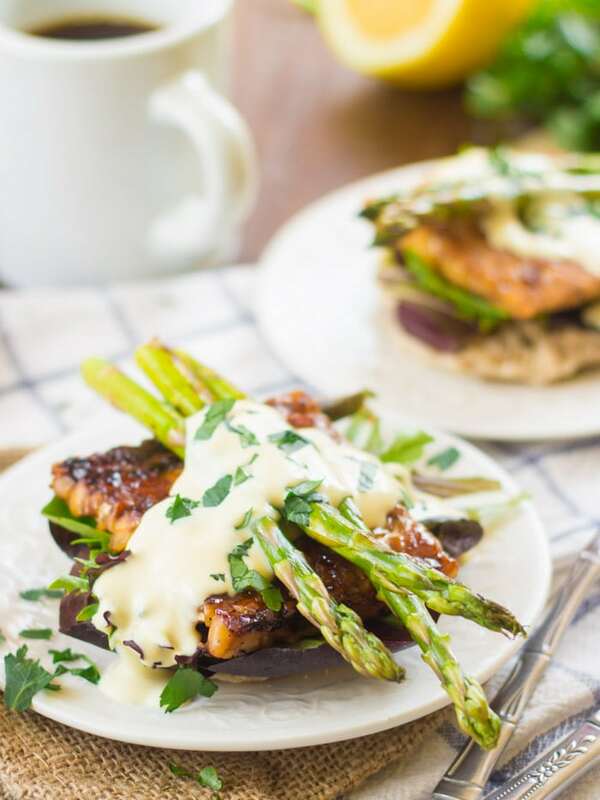 Place 2-3 asparagus spears over tempeh and drizzle with vegan hollandaise sauce. Sprinkle with parsley and black pepper, if desired. Serve. Thank you so much for your time. I’m going to try it! Made it,ate it, loved it! I skipped the English muffin. I just piled the tempeh and asparagus on a bed of lettuce with sliced avocado on top. Also, I added a bit of turmeric and cayenne to the sauce. It was so beautiful and delish. Thanks for sharing! Nom, nom, nom! Yay!! That sounds delicious! So glad you enjoyed it! Thanks Elizabeth! disappointed by how bland the holindaise sauce was! I felt mislead. Could have made a better sauce using my common sense. Otherwise good. Thank you for making vegan food! I’m sorry the sauce didn’t do it for you! You could try adding a little more lemon juice and/or salt if you’re up for trying it again.